But, I digress... I got to the Mesa Water District headquarters on Placentia Avenue with 10 minutes to spare. However, all the parking spots were already taken and folks were being routed out to the back lot, near the dirt piles, to park. The Board Room would be guaranteed a standing room only affair, so I just blew it off and came home. I'll check with the District Friday morning and report the results of their vote. However, do not despair... let's talk about the other end of the pipe! Monday night I blew off another meeting - that was a town hall conducted by the Costa Mesa Sanitary District - one of three planned - to discuss their plan to initiate an Organics Recycling Program. The meeting room at the Halecrest Community Center was packed - standing room only - so I gathered up the literature, took a few photos and left for the Planning Commission meeting. We've written about Organics Recycling before, about fifteen months ago when they first announced this plan. So, let's rehash this program. I'll provide you with some links and some answers to questions and remind you that the next town hall is this Saturday, May 16, 2015, at the Neighborhood Community Center, 1845 Park Avenue, beginning at 9 a.m. This is for you working folks that cannot make evening meetings. The final town hall will be held on Tuesday, June 2, 2015 at 6 p.m. at Back Bay High School, 390 Monte Vista Ave. I will NOT be attending that one because it conflicts with the City Council Meeting. Basically, in a nutshell, the Costa Mesa Sanitary District, through their trash hauler, CR&R Environmental Services, will replace one of your current trash cans beginning in June through the middle of August with an Organics Recycling cart. 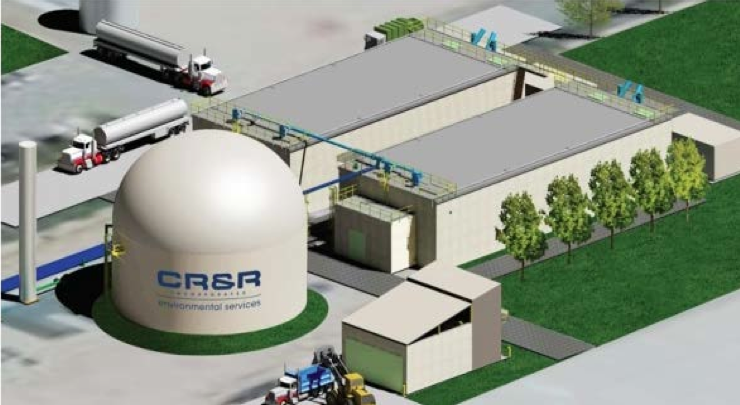 It will have a different colored lid, at least, and will be used strictly for stuff that can be processed in CR&R's new $25 million plant in Perris, CA. Things like green waste - grass, shrubs, etc., - and food waste, like grease, bones, vegetable matter and newspapers. Those cans will be collected by a separate truck, which means TWO trucks through our neighborhoods each week instead of one. Twice as much heavy truck traffic on our residential neighborhood streets. All other trash that you accumulate will be placed in the other cart. That Organic stuff will be hauled out to Perris and processed through the Anaerobic Digestion Plant and produce fertilizer and methane gas, which will be used to power their fleet. Go the the Costa Mesa Sanitary District Site for this program, HERE, to begin learning more about this program. When you get to that page, slide over to the Organics Recycling tab with the flashing arrow and read the drop down menu of subjects. Almost every question you might have will be answered. In fact, you can watch the slide show of their town hall presentation, too. As I suspected they might, they've done a little bait and switch on us. During the earlier meetings on this issue I asked if folks could simply NOT participate in this program. The answer at that time was a simple "Yes". Well, now that "Yes" comes with a caveat... you must ASK for permission to opt out and must meet specific requirements as defined by the Sanitary District. Before you get all agitated, the restrictions make sense... you can read about it on the site. Yes, they're going to make counter top kitchen pails available to us so we can collect all that food waste. Yes, it will take some getting used to. Yes, we will be able to buy compostable bags for those pails. In fact, on that subject, do a Google search for counter top trash pails and you'll find an array of decorator-type pails you can buy on your own. In fact, doing this makes a lot of sense. Southern California is running out of landfill space. This plan by CR&R is leading edge - nobody else is doing it and it's going to save a lot of space. It's going to cost us a little more, but nobody will ever pay less than we will - a guarantee by CR&R. In fact, the costs have gone down since the original presentations last year. Please go to that link and read the first paragraph, which describes the reason for this plan. Follow the other links for the FAQs, Cart distribution schedule (I'll get mine right after Independence Day) and you can also view the slide show AND Barry Friedland's Costa Mesa Brief coverage of an earlier meeting. I'm planning to attend the Saturday morning event at the Neighborhood Community Center. See you there. Many other cities have been trash sorting for years with 3 bins - one for recyclables, one for green waste, and one for plain old garbage. You should be saving all your peelings and cuttings already. They make your Monday soup stock. Indeed, and now the Organics Recycling program makes it easier to dispose of that stuff... it all goes in the same cart with the lawn clippings, tree-prunings and other organic recyclable items.